Happy Valentine's Day from the animals! We all love animals – our own animals, animals in our community and animals around the globe. Valentine’s Day is one of those special days on the calendar where many of us make an extra effort to show loved ones just how much they mean to us. How can you express this love and help an animal in need? We have a Heart Warming Gifts Catalogue that replaces or adds to that special box of chocolates or Hallmark card. I have used the OHS Online Gift Catalogue in the past to make a gift to a loved one who has everything or lives out of town. 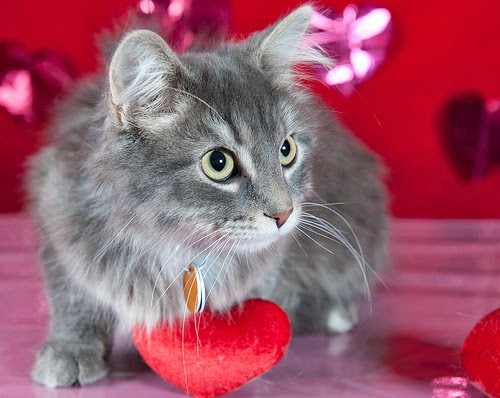 Your valentine gets an e-card with a cute animal picture on the front and best of all – you get to use your own words to tell your loved one just how much they mean to you! A little tip: Google Valentine’s messages and you will end up looking like an 18th century French romantic poet. It’s easy, safe and secure. All you have to do is visit our Heart Warming Gifts page and go shopping! I hope your Valentine’s Day is filled with warmth and love. Join Us for Some Free Valentine’s Day Family Fun!